In their discussion of The Neuroscience of Leadership, Schwartz and Rock say that focus, or attention, plays a critical role in how we use our working memory on a daily basis. 50 years ago people were not using much working memory. Now people are required to use their working memory all day. Every time you get an email with a challenge you’ve got to sit down, you’ve got to think about it, you’ve got to make a decision. Email is a classic working memory situation. You’ve got to hold the ideas in mind. At the core of their findings is working memory. 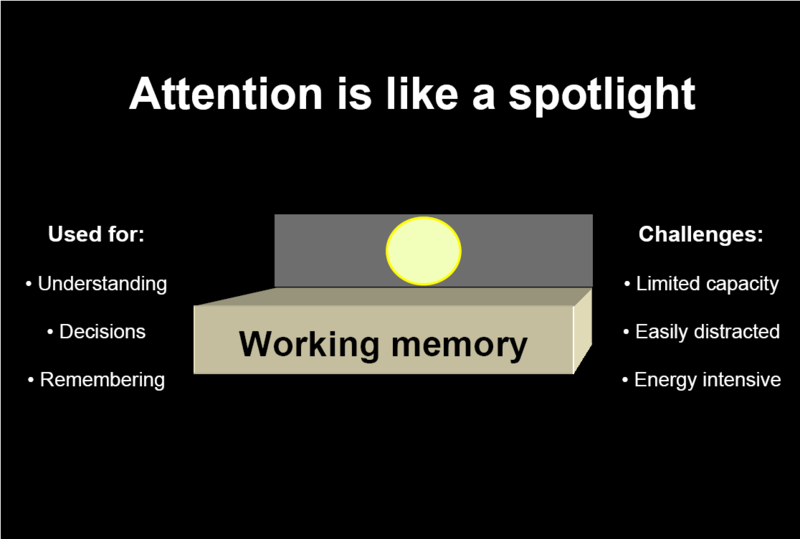 Working memory is a limited resource that is easily distracted. Since our days are filled with distractions we need to be intentional about how we manage our time. In addition to affecting how we use our working memory throughout the day Schwartz and Rock say that “attention has huge power to change the brain.” In other words, learn. Performance support systems provide a great way to get the most of our working memory. They improve productivity by reducing the amount of information a person has to retain. An example of a performance support system is a search warrant writing tool I co-developed. 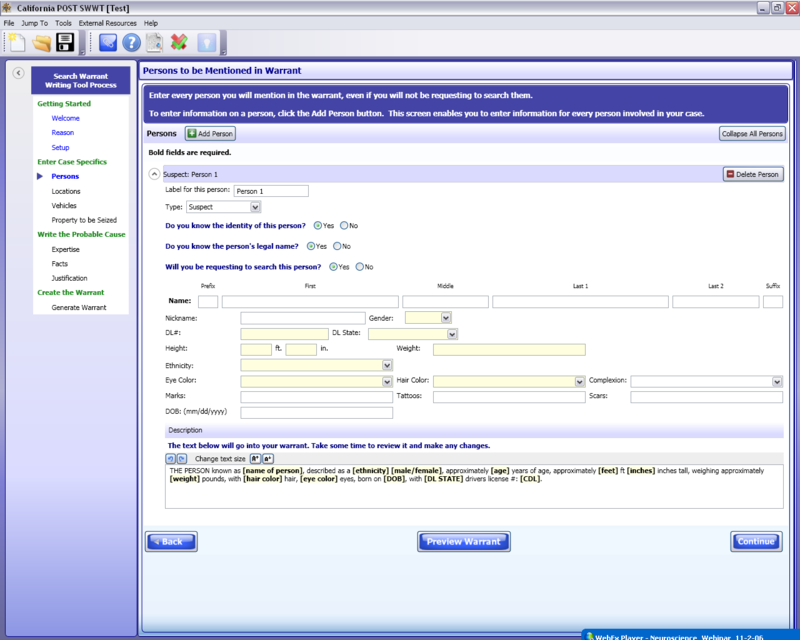 The image below is of a screen where the user inputs information about a person named in a warrant (click to enlarge). This screen uses filtering to narrow the focus on required information about a person involved in a particular case. By eliminating unnecessary fields, the user is able to input information with confidence instead of deciding what is necessary or appropriate. With repeated use, the user will gain confidence and change the way the approach warrant writing. This is a change in the hardwiring of the brain, which is what it wants to do. The design of a performance improvement solution resembles traditional instructional design. You must articulate goals and objectives and any unique conditions that apply to the performance. It must be clear how the goals and objectives will close the performance gap. Where human performance technology differs from instructional design is in the nature of the solution. An instructional designer designs and implements learning solutions. A human performance specialist can be responsible for redesigning work processes, individual and organizational development, and developing training. Below I will summarize two projects I have worked on to illustrate these points. Receiving product shipments correctly in stores is critical to ensure correct accounting and to optimize sales. While this is a critical function, it does not need to be performed by management. Associates can follow the steps to scan merchandise into the store’s inventory and coordinate with the manager to resolve any problems. To be successful, an associate must be able to demonstrate competency with the receiving processes and pass a test on specific policy issues. The solution was to create training materials based on receiving processes and to develop a test covering important policy issues. Store managers were provided with the training materials and instructors for using them. The test included references to the policy manual to ensure they provided the correct information to associates if they missed a test question. To ensure accountability, a checklist was created for manager’s to sign and date when an associate completed each part of the certification. This enabled supervisory staff to review compliance easily and quickly. Writing a search warrant is intimidating and requires specialized writing. It is intimidating because a police officer will have to present their warrant to a judge for approval. Most officers do not have any idea what to expect that to be like. It is common practice for an officer to ask his or her colleagues for an example when they have to write their first warrant. This can be helpful to get started but it can also perpetuate mistakes. The solution to this performance issue was to create a tool similar to TurboTax to help officers write their warrant. The goal was to provide court-tested language for specific parts of the search warrant (certain parts of the warrant are case-specific and can’t be provided). We also created training to demystify the process of preparing and getting a warrant signed by a judge. We taught officers what to gather and how to prepare the information for their warrant. We also walked them through the process of presenting the warrant to a judge and what to do at the court house. Both of these were made available online through a secure website to facilitate access. The gap in this project dealt with interviewing victims and witnesses of violent or traumatic events. Ideally officers would be able to gather detailed information from victims and witnesses in these circumstances. However, the affects of the event interferes with a victim or witness’s ability to recall the event accurately. We determined that the performance problem was process related. Officers were using traditional interviewing techniques when a more advanced technique was required. We convened interviewing experts to determine the best technique to teach and to design training that would equip officers. Our design provided background on how the brain stores information and specific methods for retrieving memories.